Ackleson, S. and Moses, W. (16-Jan-18). Click here to view this presentation with audio. Ackleson, S. and Moses, W. (17-Jan-17). Click here to view this presentation with audio. In response to solicitation NNH13ZDA001N-PACEST, Pre-Aerosol, Clouds, and Ocean Ecosystem (PACE) Science Team, we propose to investigate uncertainties in Case II inherent optical properties (IOPs) and associated water constituent properties (e.g., concentration, composition, and morphology) and to examine the impact of uncertainties on recommended PACE data products for coastal ocean, estuarine, and inland waters. 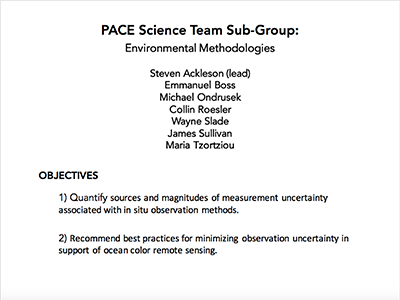 These objectives strongly address ocean color science needs articulated within the PACE Mission Science Definition Team Report (October 2012) pertaining to marine biogeochemical cycles associated with land-ocean interactions in response to climate change. As a collaborative member of the IOP working group (ST/IOP), we will utilize existing in situ and remotely sensed data sets as well as new observations to be collected during the period of performance through existing and planned field campaigns. 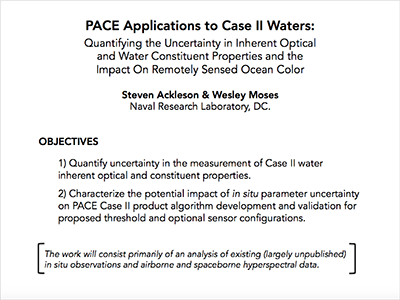 Uncertainties will be estimated through direct comparisons of optical and water constituent properties measured or derived through independent means, comparisons of functional relationships between associated parameters with relationships that have been published and vetted by the research community, and through tests of optical closure. 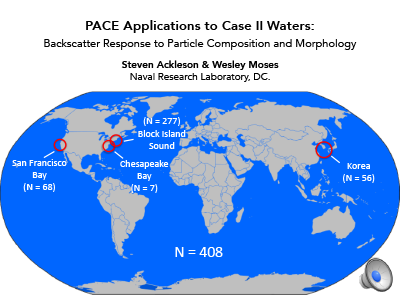 In addition to the proposed research and collaborations with other members of the ST/IOP, the PI, Dr. Steven Ackleson, proposes to be the overall PACE Science Team leader. Working closely with NASA-appointed representatives, Dr. Ackleson will be responsible for organizing, planning, and chairing team meetings, coordinating focused working groups, integrating results, building consensus on PACE science objectives and requirements, representing science team activities at professional meetings and symposia, and preparing progress reports and consensus statements as directed by NASA. Kappus, M.E., Ackleson, S.G., Bowles, J.H., Corson, M.R., Davis, C.O., Gao, B.-C., Gould, R.W., Korwan, D.R., Lewis, M.D., Lucke, R.L., Montes, M.J., Moses, W.J., Nahorniak, J.S., Patterson, K.W., and Wagner, E.J. (2015). Hyperspectral Imager for the Coastal Ocean on the International Space Station, in Optical Payloads for Space Missions (ed S.-E. Qian), John Wiley & Sons, Ltd., Chichester, UK, doi: 10.1002/9781118945179.ch2. Ackleson, S.G. and O'Donnell, J. (2011). Small-scale Variability in Suspended Matter Associated with the Connecticut River Plume Front, J. Geophys. Res., 116, C10013, doi: 10.1029/2011JC007053. O'Donnell, J., Ackleson, S.G., and Levine, E.R. (2008). On the Spatial Scales of a River Plume, J. Geophys. Res., 113, C04017, doi: 10.1029/2007JC004440. Ackleson, S.G. (2006). 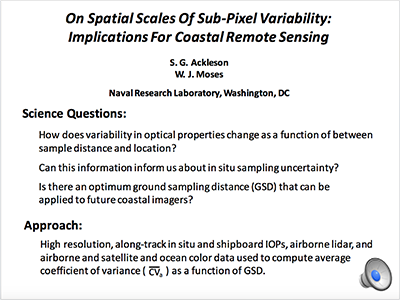 Optical Determinations of Suspended Sediment Dynamics in Western Long Island Sound and the Connecticut River Plume, J. Geophys. Res., 111, C07009, doi: 10.1029/2005JC003214. Ackleson, S.G. (2003). Light in Shallow Waters: A Brief Research Review, Limnol. Oceanogr., 1, part 2, doi: 10.4319/lo.2003.48.1_part_2.0323. Ackleson, S.G. (2001). 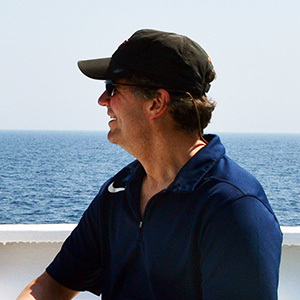 Ocean Optics Research at the Start of the 21st Century, Oceanography 14(3), 5-8, http://dx.doi.org/10.5670/oceanog.2001.19. Voss, K.J. and Ackleson, S.G. (1996). Ocean Optics Revisited, Optics & Photonics News 7(11), 31-36, doi: 10.1364/OPN.7.11.000031. Yoder, J.A., Ackleson, S.G., Barber, R.T., Flament, P., and Balch, W.M. (1994). A Line in the Sea, Nature, 371, 689-692, doi:10.1038/371689a0. Ackleson, S.G., Balch, W.M., and Holligan, P.M. (1994). Response of Water-leaving Radiance to Particulate Calcite and Chlorophyll-a Concentrations - A Model for Gulf of Maine Coccolithophore Blooms, J. Geophys. Res., 99, 7483-7499, doi:10.1029/93JC02150. Townsend, D.W., Keller, M.D., Sieracki, M.E., and Ackleson, S.G. (1992). Spring Phytoplankton Blooms in the Absence of Vertical Water Column Stratification, Nature, 360, 59-62. Balch, W.M., Holligan, P.M., Ackleson, S.G., and Voss, K.J. (1991). Biological and Optical Properties of Mesoscale Coccolithophore Blooms in the Gulf of Maine, Limnol. Oceanogr., 36(4), 629-643. Ackleson, S.G. and Holligan, P.M. (1988). AVHRR Observations of a Gulf of Maine Coccolithophore Bloom, Photogrammetric Engineering and Remote Sensing, 55(4), 473-474. Ackleson, S.G. and Klemas, V. (1987). 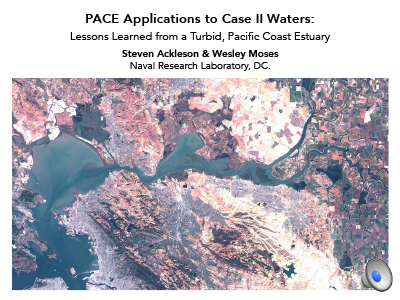 Remote Sensing of Submerged Aquatic Vegetation in Lower Chesapeake Bay: A Comparison of Landsat MSS to TM Imagery, Remote Sens. Environ., 22(2), 235-248.